You'll be amazed at the style and functionality of this simple transitional changing table from the Cotton Candy collection. The drawers with their profiled edges, the attractive legs and the wooden knobs will add a touch of pizzazz to baby's room, while also providing you with the storage space you need for diapers and wipes. This versatile, timeless piece is a smart, economical choice, since your child can use it for years to come! The right-hand section of the table top is large enough to hold jars of cream, wipes and stuffed toys. Behind the door are 2 sliding shelves - ideal for keeping diapers, facecloths and other essentials within easy reach. 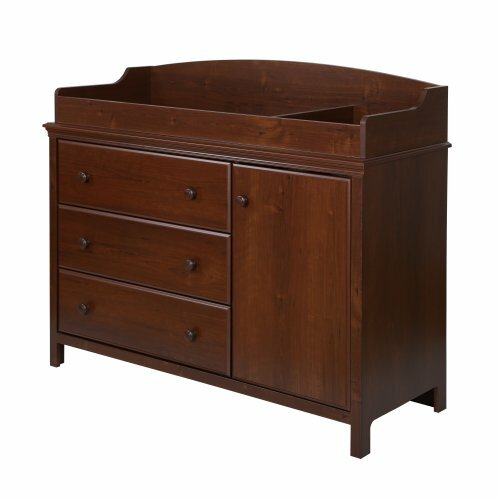 The 3 large drawers are perfect for clothes, toys and blankets. Rounded features and secure front panel for added safety. Perfect for babies of up to 30 lbs. For your children's safety and your own: plastic drawer slides with safety latch and dampers. Drawer No.1 dimensions: 26" (L) x 13,5" (D) x 5,25" (H). Shelf No.1 dimensions: 16'' (L) x 17'' (D). Shelf No.2 dimensions: 32,5'' (L) x 17'' (D). Changing station dimensions: 32,5'' (L) x 17'' (D). Safety is an integrated part of our values: this product meets or exceeds all North American safety standards. Mattress and accessories not included. Requires complete assembly by 2 adults (tools not included). Product dimensions: 47,5" (L) x 19,5" (D) x 37,75" (H). Box dimensions: 57" (L) x 20,5" (W) x 7,5" (H), 128 lbs. The box for this item is heavy, so be sure to have a friend with you - or good biceps! - when it arrives. This product's packaging has been tested and is certified to reduce the risk of damage during shipment. Made in Canada with non-toxic laminated particleboard. Clean with a dry damp cloth. 5-year limited warranty.